Pharmaceutical R&D is an interesting field. While I don’t work in it, the field of pharmacogenomics, or the tailoring of drug design and therapy to the genetic makeup of the patient, interests me greatly. The ruminations snowball…what happens if someone’s body chemistry alters to the point that formerly benign substances become poisonous? How does that person react? How do the physicians who have to attempt to treat this person deal with their lack of ability to do so, in an age where the knowledge base is so deep and broad that the question of “how to treat” has not been considered an issue for quite some time? To take it one step farther…what if that person’s condition does not remain static, but changes constantly? What if, just when you think you have their treatment under control, they develop some other idiosyncratic condition? How do you hit the constantly moving target? Jani Kilian has, in one form or another, been stewing in my backbrain for 8 or 9 years. I initially planned to portray her in a series of short stories. She was much less sympathetic back then, a drug-addicted sociopath whose never-ending quest to sate her various hungers led her into the paths of unsuspecting innocents. Sometimes, she helped them, as long as there was something in it for her. As the ideas grew to novel-length, I realized someone might be able to turn a completely unsympathetic individual into a series centerpiece, but that someone wasn’t me. Slowly, Jani evolved into a conflicting combination of survivor guilt, hair-trigger survival instinct, and protectiveness toward those she considered ‘under her wing.’ She’s capable of heroic acts, but she’s not a heroine. 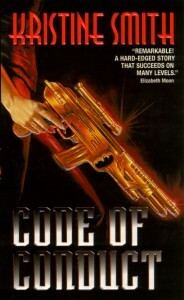 Because of CODE’s mystery aspects, I originally tried to set the story in London, England. Blame the influence of Sayers and Christie. But after failing to create a sound sense of place, I realized I lived quite close to a fine location, and one, since the story is set in the future, which I could rework at will. Some parts of Chicago will seem familiar. I enjoyed preserving place names: O’Hare, Boul Mich. Substituted “The Parkway” for North State Parkway, and consolidated most of the North Shore into “the Wilmette Bluffs.” Reopened Fort Sheridan. It’s fun when it’s your ball. 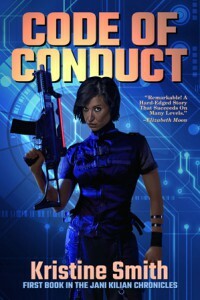 Read the first chapter of CODE OF CONDUCT.